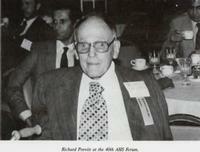 Richard H. Prewitt, a helicopter industry pioneer, died on August 11, 1985. He was 84. Prewitt, AHS president from 1947-48, got his start in the industry with Kellett Autogyro Co. in 1931. As vice president and chief engineer, he was responsible for the design and testing of many autogyros including the commercial KD-1, the Airmail KD-1A and the military YG-1, YG-1A, YG-1B, YG-1C, XR-2 and XR-3 autogyros. In 1946, Prewitt established his own company: Prewitt Aircraft Co. The company was involved with the research and development of rotor blades and their production. Prewitt held 25 patents on autogyros and helicopters.